Open many accounts of events in Baltimore just after the clash between an angry mob and Union volunteers along Pratt Street, and you are likely to find some mention of a mysterious weapon, said to be invented and built by wealthy industrialist and friend of the South, Ross Winans. Considerable ink was spilled in those long ago times, as word of this dangerous weapon spread across the land. Alas, after a desperate attempt to sneak the weapon out of town, it was captured by Union troops, with is inventor barely escaping capture with the gun’s most crucial part, rendering it useless. 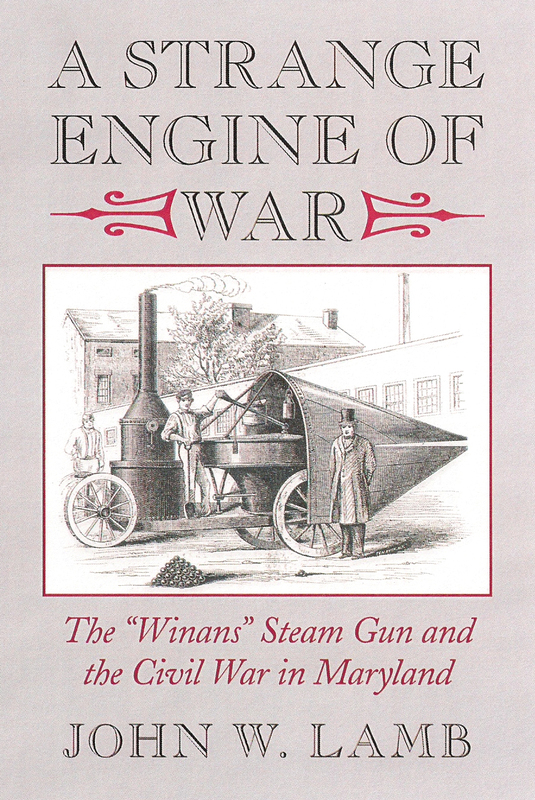 “Perhaps it was the gun’s menacing appearance, or its arrival on the public stage at the height of anxiety after the riots, but either way, the true origin of the gun was lost as its story, merged with rumors, and twisted by sectional tensions blossomed into charges of treason for Ross Winans,” says historian, John Lamb, whose book on the Steam Gun, is forthcoming from the Chesapeake Book Company. Immediately after the Baltimore Riot of April 19, 1861, the gun was taken for Dickinson’s associates, by City Police. “Available evidence suggests that like several other artillery pieces, the gun passed through the former locomotive works of Ross Winans,” Lamb says. 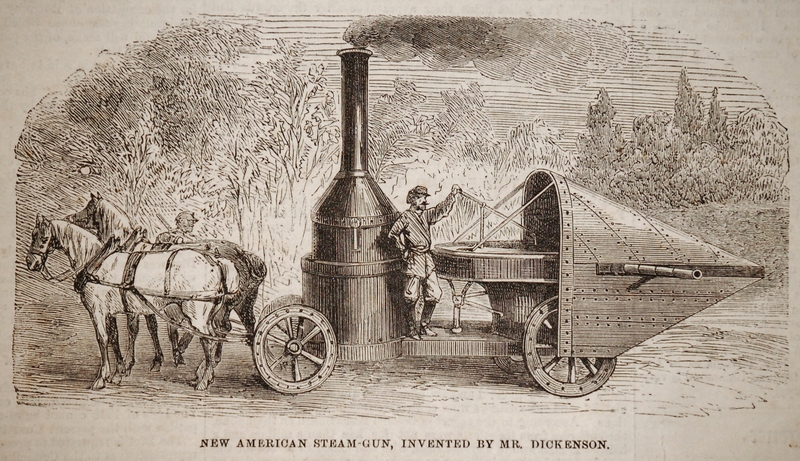 “While early reports, noted the connection to Dickinson, others noted that a steam gun from Winans shop was on display outside Old City Hall, which was serving as an armory for weapons being gathered by the city. After being on displayed it was sent to Winans shop for repair. “ By this point, the city was done with it, and it was returned to Dickinson who promptly hired men to drive it to Harper’s Ferry – the plan was to sell it to Confederate troops. When Union troops at Relay heard that the gun was headed out of town, an orderly rode ahead, drew a gun on the teamsters, and marched them on foot to Ellicott’s Mills. Meanwhile, a detachment of infantry and artillery, arrived via B&O train, secured the gun, and returned with it to their Camp at Relay. The gun attracted much attention. “Several press accounts noted that it was useless due to Dickinson’s alleged escape with key parts. However, several letters sent to papers at home by Massachusetts men in the camp, reveal that mill mechanics in the 6th Massachusetts tested the gun at relay,” Lamb says. Sent first to Annapolis, then to Fort McHenry, then to Lowell, Massachusetts, by the fall of 1861, the gun was in the hands of the Middlesex Mechanics Association. While there it was exhibited at agricultural fairs and other events until interest past. It eventually was scrapped, says Lamb. “According to published reports, Civil War veterans crowded the room trying to buy its parts. Perhaps, somewhere in nearby home, museum or neglected corner, a piece of the gun remain. While the basic facts of the story were talked about at the time, they soon faded from memory. “News paper articles around the 50th anniversary, helped bring out the story of its last days,” Lamb says. “During the 100th anniversary, a replica was built for a reenactment of the gun’s capture. In 2007, Mythbusters on the Discovery Channel put the idea of the gun to the test. As we reach the 150th anniversary of the Baltimore Riot which brought to the gun to prominence, it association to Ross Winans, born in the panic after the riot, continues, and probably always will, despite the real facts of its invention and construction, which were circulated widely at the time, but are just now being considered, as a fuller picture of the gun’s story emerges. 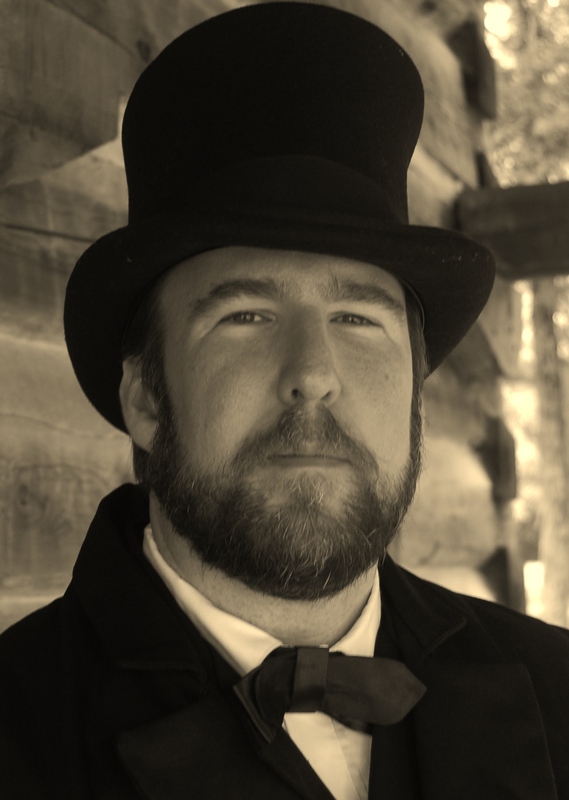 John W. Lamb, author of A Strange Engine of War: The “Winans” Steam Gun and Maryland in the Civil War works in communications and development in the non-profit sector, is interested in Maryland’s Civil War history, 19th Century technology and shapenote singing, and appeared on the Discovery Channel’s Mythbusters series episode regarding the Winans Steam Gun. He lives in Harrison, Tennessee, with his wife and 3 children. While rapid fire weapons are generally thought of as a 19th Century invention, James Puckle patented a rapid fire gun in 1718! Rain’s deadly hanywork was put to use at Battery Wagner to fend off the attack by the 54th Massachusett- Rain’s Subterra shells were pressed into service as immense hand grenades. This along with a heavily entrenched position helps explain the terrible loss of live in the 54th, whose service is recounted in the movie Glory. From London’s Science Museum website comes “Electricity on Show” a four part paper detailing science exhibits – particularly electricity related ones -as public entertainment in 19th Century England. Contains details of a number of interesting exhibitions, including mentions of Tesla and Jacob Perkins, mentioned elsewhere in this blog in connection with his steam gun. The Museum of Retro Tech is a great collection of interesting technology – odd steam engines, early communications devices and more!